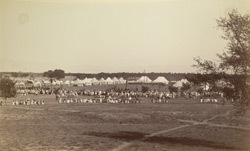 Photograph taken by an unknown photographer in c. 1882 with a view of the camp for the opening ceremony of the Sirhind Canal in Rupar, Punjab, India. The Sirhind canal was opened in 1882 and takes its water from the river Sutlej, a tributary of the Indus river, at Rupar. The canal is navigable for 180 miles from its head to Ferozepur, where it joins the river and forms a continuous waterway to Karachi. An area of 8,320 square miles is irrigated by the canal, just under half of which was British territory in 1882. The Maharaja of Patiala, a neighbouring state, contributed to the cost of the canal's construction. The area watered by the canal, Sirhind, is a tract of land in the Punjab state of India and includes the districts of Ludhiana and Ferozepur, together with the former princely states of Patiala, Jind and Nabha. Rupar is an ancient town which has archaeological sites dating from the Indus Valley Civilisation 5000 years ago.